Tired Mommy Tales has moved! Head on over to http://www.tiredmommytales.com to get the latest!!! It can be just as messy as diapers. I don’t know what made me think that the mere shift from a diaper to a pull-up would make changing time any cleaner. It’s not. Speaking of pull-ups….why exactly are they more expensive than regular diapers? And they don’t seem to ever be part of my favorite deal at Babies R Us that gives you gift cards when you buy jumbo boxes. I’d been planning to build a stash of cloth diapers for our next baby and started early so that we can cloth diaper at home and only buy pull-ups for school. You spend a lot more time on the bathroom floor. I seriously didn’t clock this much time sitting on the bathroom floor since my morning sickness and college party days combined. Nothing prepared me for the fact that Brooke was going to view her potty time as a social event. Heaven knows I’m waiting until I can go uninterrupted again!! Public bathrooms are even more disgusting. They were bad before but I didn’t think about it much. Now that I find myself squeezing into a stall with Brooke, holding her on the seat, trying to get her re-dressed with minimal floor-touching, hoisting her up to the sink to wash her hands I am in a continuous . Icky Icky!! When we remember to bring it along, this portable potty seat is really handy though! How many times we’ d have to interrupt dinner to race her to the potty. Really, how does her body clock seem to know when I’ve just taken a huge bite and she’s just stuck her hands in cottage cheese? I realize potty training is just a phase and this too shall pass. Until then, I gotta keep my sense of humor about it all, right? No, not the movie. Although we rented it last week from redbox and it wasn’t too bad. We bought a dining room table today!!! 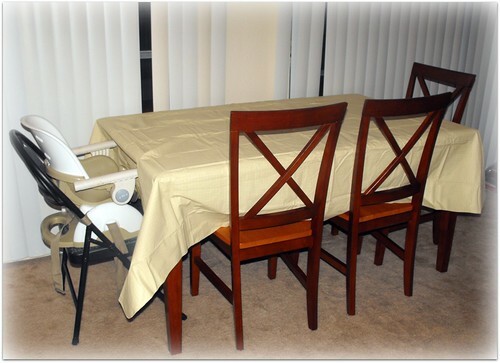 For the past five and a half years, we’ve been eating on a little card table and folding chairs. Totally fitting for my basement apartment when I was living by myself after college. Now that we’re 30 years old and have a kid, it was starting to feel a little pathetic. When we saw a Groupon deal offering $200 of furniture for $40, we jumped on it. And today, with rambunctious toddler in tow, we got ourselves a grown up dining room table!! 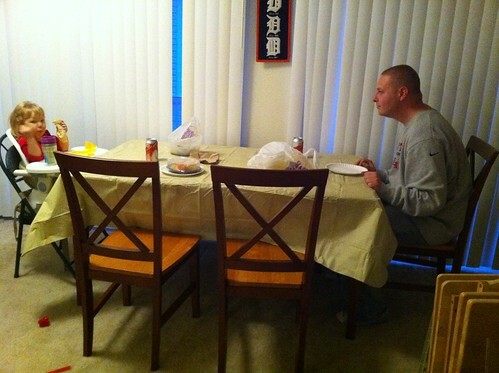 Something about all 3 of us being able to sit and have dinner comfortably makes me feel like I’ve got things a little more together. Except for the fact that our first meal on the new table was Taco Bell drive-thru….as Puss in Boots says in the “Shrek the Halls” (which I don’t think we’ll ever stop watching nightly), “I have shamed myself”. Have you ever had a defning moment that would seem silly to someone else??? If you’ve followed my blog for any amount of time, you’d know that my posting can be sporadic at best. Wordpress is hosting a Post A Week challenge and I’m gonna go for it!! I know it won’t be easy, but it might be fun, inspiring, awesome and wonderful. Therefore I’m promising to make use of The DailyPost, and the community of other bloggers with similiar goals, to help me along the way, including asking for help when I need it and encouraging others when I can. Also, keep an eye out for my post tomorrow…its my first giveaway!!! If you’re on Facebook I’m sure you’ve seen many of your friends share the video made by Ellen Degeneres regarding the rise in teenage bullying and suicides. I agreed with her message and clicked the “Share” button with no hesitation. Looking through my newsfeed, many of my friends did as well. But now what?? As much as I’d like to think it will, sharing a video on Facebook isn’t going to halt this vicious cycle. What tangible actions do we take to keep more precious kids protected? To keep more kids from having so little self-respect that they have to break down others to make themselves feel good about themselves? What resources are out there to help these kids? It would be easy for me to shrug and say “My daughter’s 2. I don’t have to worry about this yet.” But I am worried. If nothing changes, what will the schoolyard be like in 10-12 years? Will bullies find another vessel to spew their hate? I don’t want to sit by and find out then. The easy answer is everyone parent their kids. Teach them to respect others. Make them feel supported and that they can come to you if they are being bullied. But that message must be falling on deaf ears if children are still dying. Somebody is not holding up their end of the bargain and I’m not waitng for my kid to be picked on to the point they see no point in living to do something about it. So again I ask…now that we’ve “shared” Ellen’s video, what are we going to do now? If you like what you read, vote for me! !